Two performances of “What Matters” by Randi Driscoll: the first by the composer (YouTube video), the second by the Gay Men’s Chorus of Los Angeles (an audio file:click the play button). This is an arrangement by Kevin Robison available in three voicings sung here is the TTBB version. When I first heard the story of what happened to Matthew Shepard, I was saddened and outraged. I wanted to kick in my television, rip out my heart and cry all at the same time. I was horrified at what humans were capable of. However, I then remember seeing his parents, outside in the rain, shortly after his funeral. I was speechless and stricken by their sense of compassion and decency. I clearly remember the way the Shepards told us to pray for Matt and not harbor any feelings of hatred for his attackers. I also remember clearly how they described their son as a man who would not want us to hate…because Matthew loved and accepted everyone. Their grace moved me to tears. So with that, I went into my bedroom and wrote a song about Matthew and the love he represents. I planned on sending a taped copy to his parents, as a form of my own personal condolences. And then there was Dana. Dana LeeWood is another musician from San Diego. She was performing that evening as well. When Dana heard the song, she began to sob and immediately began to tell the audience how passionately she felt about this incident. It seemed Dana’s brother had taken his own life, due to the pressures he felt being a gay man in today’s world. Dana encouraged me to record the song. She pursued me for several weeks, bringing people to shows and talking about Matt’s story. Finally in January, Dana amazed me by giving me some free studio time she had won at Studio West in San Diego. With the help of many musicians who shared their time and talents, and a small company in LA, we were able to record this song. Dana hoped to share the song with many people by selling the CD single. We agreed that the only way to do this was to have all of the proceeds from the single go to anti-hate crime organizations: i.e.. The Matthew Shepard Foundation. We decided to release only a limited pressing. We chose not to do a major media press release in hopes of maintaining the integrity of the project, but rather hold a small fund raiser at a local venue in town, Twiggs coffeehouse. Imagine our surprise when on March 5th, 1999, the intimate coffeehouse was packed to the gills with people. Local citizens and musicians came to help support the cause and to perform. A local publication, Slamm magazine, took out a full page ad on the benefit, and Tracy Page Presents donated prizes for a raffle. The evening was so beautiful. It brought me to tears to see the room packed with people who cared so very much. That same evening we informed the audience about anti-hate crime organizations and made web site addresses available for them to take home. We were able to sell over over 200 CDs that evening alone. I can remember driving home with a feeling of hope that I hadn’t had in a while. Through my contacts with anti-hate crime organizations, I was invited to meet with Judy Shepard on Easter Sunday in Laramie, Wyoming, to speak with her and share Matthew’s song. I sat next to a woman who had, only six months earlier, lost her son to a vicious hate crime. Yet, there was no hate that I could see. She spoke of her son with a warm smile….and with grace…always grace. She seemed determined to have his death not be in vain as she spoke about her hopes for a better tomorrow. Along with Judy, there were many other angels that weekend in Laramie. Gathered outside of the courthouse in Laramie for a press conference in support of active measures against hate were members of GLSEN, Cathy Renna of GLAAD, Valerie Baker-Easley of LAMBDA , Marlene Hines of the North West Coalition Against Malicious Harassment, Jerry Switzer from the B.E.A.R. Foundation and many of Matthew’s friends. People standing together on common ground, grieving the loss of Matthew and praying for a better tomorrow. People breathing the same air…under the same Wyoming sky. Since that time almost two years ago, I have traveled to over sixty cities in the USA and Canada performing the benefit single at charity events, pride festivals and concerts. I have traveled to several high schools and colleges with New Light Media as part of a program featuring the screening of the documentary Journey to a Hate- Free Millennium. I have also appeared as Judy Shepard’s guest in Oakland and the Millennium March on Washington. I thank God for what this experience has taught me. I thank him for the numerous e-mails that I have received from people who have heard the song. People who have chosen to share their most intimate details with me. Stories of love, acceptance and hope. I also thank God for the people I’ve met at shows. I thank God for the woman who lost her friend to a suicide, for the man who received a copy of the song as an Easter gift and for the strangers who hug me with tears in their eyes and say thank you. And I thank God for the Shepards. I have often said that this work is the most important work I have ever done….and this song, .the most important one I have ever written. I have seen angels, who believe as I do, that love is unconditional…that love has no face. Today is Gay Pride Day in West Hollywood. We haven’t gone in years, not that we aren’t proud, it’s just, well, we don’t go any more. Last night before I heard the premiere of Paul Chihara’s terrific new choral work, MAGNIFICAT, I went to Basix, a mostly gay and lesbian restaurant by myself. I got to watch all of the out-of-towners come in in 2s and 3s and 4s. Two gorgeous thin career lesbians. Two elderly heavy and not particularly pretty dkyes. Two very homely men who [thank god] have found each other, and two pretty boys, maybe 19, who look alike and are all over each other. And over at that table is a man in his 70s looking queenly, and his much younger lover of 58 slowly down their bottle of chardonnay. They don’t smile. Walking by on Santa Monica Boulevard are lots more of all shapes and sizes, coming to WeHo for Gay Pride Day. 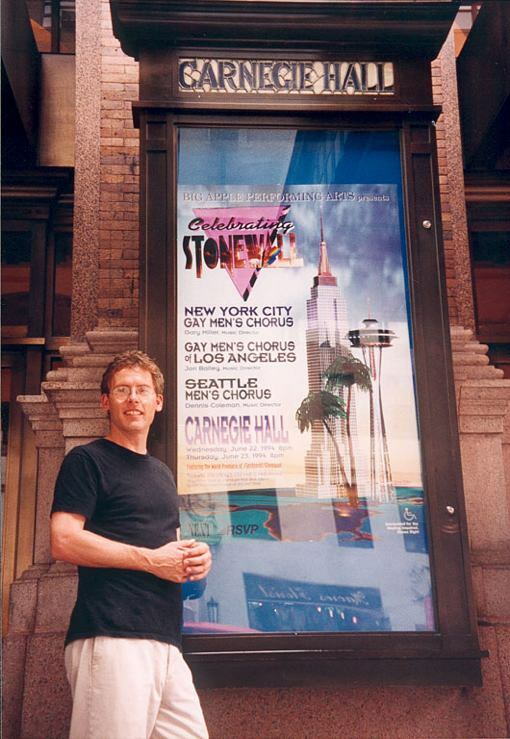 The Parade was written by John Hall and me and is from the electro-acoustic cantata, FLASHPOINT/STONEWALL (1994), for 4 synthesizers, bass (me), drums, soloists, and men’s chorus, a commission celebrating the 25th anniversary of the Stonewall riots. The consortium of commissioning choruses were the Gay Men’s Chorus of Los Angeles, the Seattle Men’s Chorus, the New York City Gay Men’s Chorus, and the Gay Men’s Chorus of Washington D.C. Each of the choruses performed the work in their own cities. I went to all of them except Seattle as I had to be in Chicago that night for a premiere my LETTERS TO THE FUTURE.